The Bold and the Beautiful (B&B) spoilers tease that Zoe (Kiara Barnes) won’t get discouraged or distracted. Despite all the drama surrounding the threats she posted online, Zoe will refuse to get sidetracked. She came to Los Angeles with one goal in mind and that’s winning back Xander (Adain Bradley). Zoe knows she has to stay committed or she won’t walk away with what she wants. Of course, Xander will do his best to get rid of Zoe. Later this week, he’ll unleash his wrath and make it clear that Zoe must go. Xander will suggest that he won’t take no for an answer. He’ll be fed up with Zoe’s stalking and meddling, so he’ll just want her out of his life for good. The more Zoe schemes, the crazier she’s going to look. Xander may think he really dodged a bullet by breaking things off when he did. However, that bullet isn’t going anywhere! Zoe will still have the chance to strike. It won’t be long until she carries out another sneaky plan, so Xander had better be ready. Unfortunately, Emma (Nia Sioux) won’t be prepared for what comes next. At the upcoming fashion show, Zoe will watch Emma’s performance and wait for the perfect moment. It appears Zoe will suddenly take the stage and show off some sweet moves of her own. Emma will be caught off guard along with the rest of the Hope for the Future team. There’s a good chance the crowd will love it, which will only add to Emma’s pain. During the week of July 23-27, The Bold and the Beautiful spoilers say Emma will struggle with doubts. She’ll feel like she’s nothing compared to Zoe, so her nutty rival may use that to her advantage. Zoe will inevitably prey on Emma’s lack of confidence. Meanwhile, she’ll try to make progress with Xander. That plan may or may not work out, but Zoe won’t give up. No matter what curveballs come her way, she’ll keep fighting for her man. That could put Emma in some dangerous situations down the road. Zoe doesn’t understand boundaries and even if she did, she wouldn’t care. 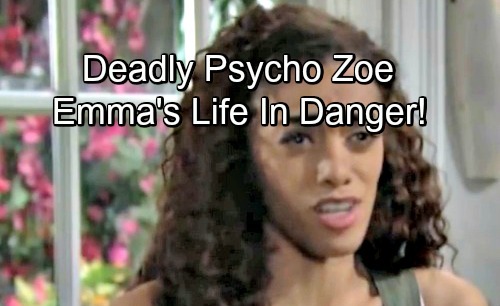 B&B seems determined to make her a real psycho, so how far will Zoe go to get what she wants? It’s easy to imagine Zoe kidnapping Emma and holding her hostage somewhere. Emma could also find herself in deadly peril. Accidents tend to happen during many Bold and the Beautiful confrontations. In this case, the nearly fatal drama would probably be intentional! If Emma lands in the hospital thanks to Zoe’s actions, that could draw Xander closer to his new love. It would also make him realize he has to fight fire with fire. Zoe won’t be out of Xander’s hair until he beats her at her own game. The Bold and the Beautiful spoilers say Xander may have to play dirty, so stay tuned for all the chaos. We’ll give you updates as other B&B news comes in. Stick with the CBS soap and don’t forget to check CDL often for the latest Bold and the Beautiful spoilers, updates, and news.